← CAN’T KEEP YOUR COOL? Most parents are not willing or able to sit quietly for fifteen minutes let along an hour. This blog post starts with an Emotional Fitness Poster Coach briefly describing the One Minute Meditation. Meditating the quick way: The One Minute Meditation. Stressful moments visit parents day in and day out. The One Minute Meditation, properly learned and practiced is key to staying in control. This quick introduction is enough for many, but others need more. 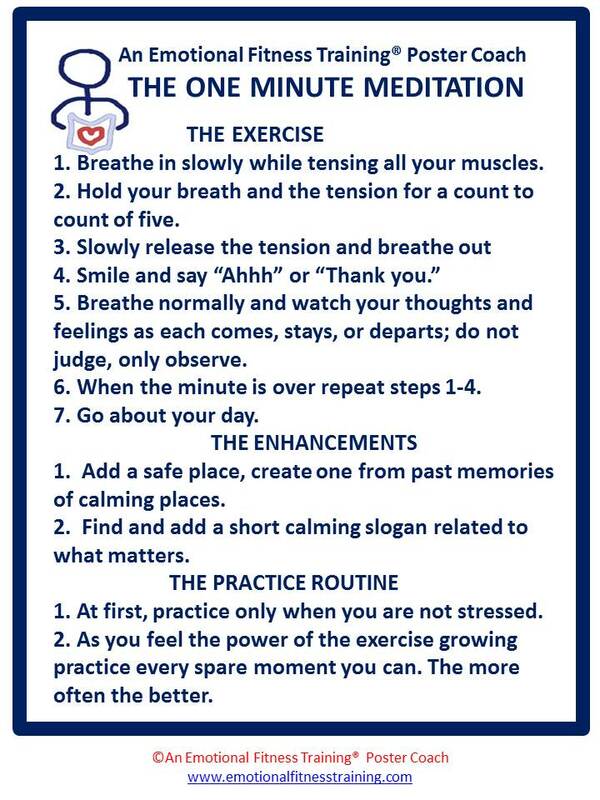 My newest eBook offers 22 self-soothing exercises as well as directions for how to how to practice each exercise most effectively. Overwhelmed with postings, mine and other people’s, one way to cut back is to subscribe to my newsletter. The Newsletter will arrived twice a month with news, a completely new post about how to stay strong, links to the best of my blogs, announcements about my books, poster coaches, give-aways, and tips for staying strong. You can subscribe from the side bar. Remember if you liked this like, comment, share with someone who needs support while staying strong. Sharing and caring strengthens you as well as others. The first: My advice is just that. Although based on what are called evidenced based practices, the is no guarantee it is the right advice for you and your family. Experiment, try my exercises, if they are not useful to you try another parent adviser. The second: I have dysgraphia, a learning disability that peppers my writing with mis-spelling and punctuation errors. All my books are professionally edited. Not so my blog post. Although I use all the grammar and spelling checks, mistakes slip by. If they bother you, seek another source of support for life’s less savory moments. Life is to short to let problems you can avoid annoy or stress you. This entry was posted in When Good Kids Do Bad Things and tagged children, Feeling management, Katherine Gordy Levine, Life, parenting, parenting tips, Parents Are People Too, postaday, Self care, Self-care, Self-soothing skills. Bookmark the permalink.